Recently a blog titled “Ideas and Data” posted a very interesting and important article by an anonymous blogger, “The Jewish Question: An Empirical Examination.” I’ll have more to say about this blog in the future, but here I discuss a study on Jewish academic influence that I was unaware of. Further, because elite universities attempt to most represent the zeitgeist of the field, Gross and Fosse point out they will offer positions to scholars they see as exemplary; political attitudes are a major part of being exemplary. As noted above, Inbar and Lammers (2012) found that many liberal academics openly acknowledge that they would discriminate against a conservative job candidate. This rigorous policing of the attitudes of professors at elite institutions in turn leads to elite institutions being to the left of lesser institutions. In the academic hierarchy, the result is that graduate students coming from elite institutions are most representative of the leftist academic culture, either because of their socialization in the academic environment or simply because of self-interest as a member of a group (e.g., racial and ethnic minorities, homosexuals) whose interests are championed by the left. This becomes progressively diluted as one goes to the second- and third-tier schools and eventually down to K–12 education. The result is a liberal social environment at all levels of the educational system which in turn has measurable effects on student attitudes. Public opinion surveys carried out since the 1960s show that going to college results in attitude change in a liberal direction compared to parents. If education level remained the same, there was little change in attitudes (Kaufmann, 2004, p. 191). Thus, academia is a top-down system in which the highest levels are rigorously policed to ensure liberal ideological conformity. I then presented material on Jewish overrepresentation at elite universities, based on a 2006 study. Related to the importance of elite institutions in shaping the intellectual climate at universities noted above, they deem it relevant to point out that Jews entered the academic world in large numbers after WWII and became overrepresented among professors, especially in elite academic departments in the social sciences — that is, in the decade immediately prior to the triumph of the multicultural left in the academic world. 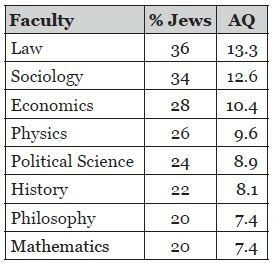 They cite recent survey data indicating that 25% of faculty at research universities are Jewish compared to 10% overall; these percentages are even higher in departments of social science at research universities (Schuster & Finkelstein, 2006). Correspondingly, conservative Protestants are underrepresented, especially among faculty of elite research universities. Further, and importantly, as noted above, the most liberal professors work at the most elite institutions — a point to be returned to below. These findings fit well with the views of other social scientists. For example, David Hollinger (1996, p. 160) calls attention to “a secular, increasingly Jewish, decidedly left-of-center intelligentsia based largely but not exclusively in the disciplinary communities of philosophy and the social sciences.” He notes “the transformation of the ethnoreligious demography of American academic life by Jews” (p. 4) in the period from the 1930s to the 1960s, as well as the Jewish influence on trends toward the secularization of American society and in advancing an ideal of cosmopolitanism. The blog post and video cited above lend important support to this thesis by mentioning two studies from much earlier, showing that by the critical decade of the1960s and continuing in the 1970s Jews were well-established in departments of social science at elite universities. An article by Lipset and Ladd (1971), using survey data of 60,000 academics from 1969, shows that the 1960s were a critical period for the rise of a Jewish academic culture well to the left of non-Jewish professors. Jews represented around 12% of faculty in general, but around 25% of the younger faculty (less than age 50) at Ivy League universities—percentages that were much higher than in previous decades. Jews were heavily represented on the faculties of other elite public and private universities as well, particularly in the politically relevant fields of the law and the social sciences. Moreover, Jewish faculty were more heavily published than non-Jewish faculty, indicating greater influence. This is important because the academic world is a top-down institution: those at the top train the next generation of scholars and police the recruitment of new faculty—a professor at Harvard places his Ph.D. students at Wisconsin, Michigan or Berkeley, and they in turn place their students at Wisconsin State University—Oshkosh, etc. They therefore have more influence on the future of the field than less-published scholars. As indicated above based on recent research, liberal faculty are perfectly willing to discriminate on the basis of political views, and I think it’s quite likely that this also occurred in the 1960s. Importantly, Lipset and Ladd also found that Jewish faculty were well to the left of non-Jewish faculty. Thus, a considerably larger percentage of Jewish faculty rated themselves as liberal or left, (74.5%) compared to less than 40% of non-Jewish faculty. In the social sciences, 84.9% of Jewish faculty compared to 76% of Protestants and 65.2% of Catholics described themselves as liberal or left. 59.1% of Jewish faculty approved of 1960s student radical activism, compared to around 40% for non-Jewish faculty. Jewish faculty were also more likely to approve relaxing standards in order to recruit more minority faculty and students. Within the Jewish segment, the least religious Jews were the most liberal. This is interesting because, as documented in The Culture of Critique, in general left/liberal Jews were not religious but were strongly identified as Jews and saw their politics as advancing specifically Jewish interests. The leftist politics of the new academic elite was thus closely related to Jewish identification. The other study mentioned by the anonymous blogger is from a book by Harriet Zuckerman which focuses on elite scientists. Providing further evidence in this regard (ethnocentric biases in citation patterns), the studies by Kadushin (1974), Shapiro (1989, 1992), and Torrey (1992) of twentieth-century American intellectuals indicate not only a strong overlap among Jewish background, Jewish ethnic identification, Jewish associational patterns, radical political beliefs, and psychoanalytic influence but also a pattern of mutual citation and admiration. In Kadushin’s study, almost half of the complete sample of elite American intellectuals were Jewish (Kadushin 1974, 23). The sample was based on the most frequent contributors to leading intellectual journals, followed by interviews in which the intellectuals “voted” for another intellectual whom he or she considered most influential in their thinking. Over 40 percent of the Jews in the sample received six or more votes as being most influential, compared to only 15 percent of non-Jews (p. 32). Although I try to avoid the word ‘control’ in talking about Jewish influence, I certainly agree that Jewish academics were a critical component of the dominance of the left in academia. In my paper, I then go on to show that the Jewish intellectual movements I discussed in CofC fit the criteria for a successful intellectual movement as described by Gross and Fosse: (1) those involved in the movement had a complaint (anti-Semitism, cultural exclusion); (2) they were able to form cohesive, effective networks; (3) they had access to the most prestigious academic institutions. As Eric P. Kaufmann points out in his account of the general decline of Anglo America, once the new value set was institutionalized, it became the focus of status competition within the boundaries set by these movements (Kaufmann, 2004, p. 247). The emergence of the new intellectual elite was facilitated because it possessed “social capital,” in the form of social ties to the mass media, corporate cultural intermediaries, and the state intelligentsia—where dominant interpretations of reality are generated (Diani, 1997; Kaufmann, 2004; Diani & McAdams, 2003). In general, the mass media was an important source of favorable coverage of intellectual and political movements of the left, particularly psychoanalysis and 1960s political radicalism (Rothman & Lichter, 1982). For example, “Popular images of Freud revealed him as a painstaking observer, a tenacious worker, a great healer, a truly original explorer, a paragon of domestic virtue, the discover of personal energy, and a genius” (Hale, 1995, p. 289). Moreover, as implied by Gross and Fosse, once an organization becomes dominated by a particular intellectual perspective, there is enormous inertia created by the fact that the informal networks dominating elite universities serve as gatekeepers for the next generation of scholars. Aspiring academics are subjected to a high level of indoctrination at the undergraduate and graduate levels; there is tremendous psychological pressure to adopt the fundamental intellectual assumptions that lie at the center of the power hierarchy of the discipline. Once such a movement attains intellectual predominance, it is not surprising that people would attracted to these movements because of the prestige associated with them. And, as Gross and Fosse argue, conservatives who are turned off by these ideas, simply self-select to go into a different line of work. I propose that once the Jewish left came to dominate the academic world, the next step was to broaden the basis of the left and consolidate their power by promoting other aggrieved groups—groups with complaints against the culture. It is certainly the case that the triumph of the Jewish-dominated intellectual movements in the academic world was followed in short order by the establishment of these other pillars of the cultural left, and making alliances with non-White ethnic groups and sexual minorities has certainly typified Jewish political behavior in the United States. Indeed, as noted throughout Culture of Critique, a common pattern for Jewish intellectual and political movements has been to reach out and make alliances with non-Jews, who often attain highly visible positions in the movement. This is necessary because Jews are a relatively small percentage of the population and cannot dominate academic discourse (or influence the political process) without allies. The culture of the left became solidified with the university when it was able to recruit these other the sexual, racial and ethnic victims who are such a large and committed portion of the leftist culture of the university. This leftist cuiture is now so well ensconced that I suspect that it is on autopilot: Even if Jewish representation at elite universities declined, the culture of grievance is firmly established and would be continued because it is manned by academics with other real and imagined grievances against the traditional people and culture of America. Conspicuously missing from the list of Jewish allies are lower- and middle-class Whites. These are the groups that were most vilified by the New York Intellectuals and the Frankfurt School, and they have suffered the most by the multicultural revolution. These people are being pushed out economically and politically. They are the enraged participants in the Tea Party movement that is so visible right now and they voted overwhelmingly for Donald Trump. They can’t move to gated communities or send their children to all-White private schools. Their unions have been destroyed and their jobs either shipped overseas or performed by recent immigrants, legal and illegal. Their fortunes will continue to decline as millions more non-Whites crowd our shores. Those among them who wish to become professors will perforce have to turn their backs on the political and economic interests their own people. The result of this revolution is the American university as we see it now. Conservatives need not apply. And heterosexual White males should be prepared to exhibit effusive demonstrations of guilt and sympathy with their oppressed co-workers—and expect to be passed over for high-profile administrative positions in favor of the many aggrieved ethnic and sexual minorities who now dominate the university. Seymour Lipset and Everett Ladd, “Jewish Academics in the United States: Their Achievements, Culture, and Politics,” The American Jewish Yearbook (1971): 89–128. Harriet Zuckerman, The Scientific Elite: Nobel Laureates in the United States (New Brunswice, NJ: Transaction, 1996; orig. published 1977). Charles E. Silberman, A Certain People: American Jews and Their Lives Today (New York: Summit Books, 1985), 350.